In the previous article, it was mentioned that the relatively small dead metal region due to flow stress model employed may cause the difference, which gives us an idea with expectation that a lower limit of flow stress model, i.e., initial yield stress will improve the problem. In this very short but important article, the effect of flow stress on the FE predictions of metal flow lines is discussed. Figure 1 compares the metal flow lines predicted by the power-law flow stress model without limit (see Figure 1(b)) and with lower limits of 80 MPa under isothermal (see Figure 1(c)) and non-isothermal (see Figure 1(d)) conditions. It can be seen that the metal flow lines after the piercing stage shown in Figures. 1(c) and 1(d) which were predicted by the power-lar flow stress with the lower limit of 80 MPa are in much better agreement with the experiments, compared to those obtained by the power-law flow stress without any lower limit in Figure 1(b). 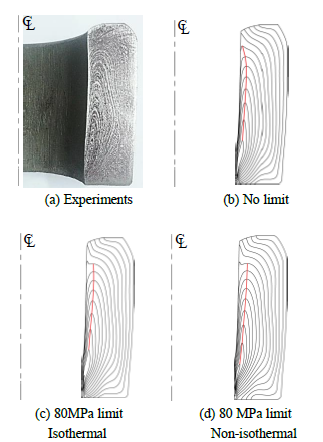 It is noteworthy that a detailed investigation shows that non-isothermal predictions in Figure 1(d) are the closer to the experiments, compared to the isothermal predictions in Figure 1(c) in terms of slope of the metal flow lines especially on the bottom side. smaller predicted dead metal zone which can have much influence on the metal flow lines especially in upsetting a long billet, i.e., a little smoothed metal flow lines. It was shown that this inaccuracy could not be neglected after the piercing stage. A realistic engineering solution of this problem is to use the conventional power-law flow stress model with lower limit of flow stress because most flow stresses are prepared based on the power law flow stress model at the elevated temperature.